Calxa provides tools for maintaining multiple budgets, including multiple budget versions for all of your business units across all financial years. Budgets are entered against your chart of accounts, which comes from your accounting system (Accounts), or you may also create custom data rows (Metrics) where you can enter both actuals and budgets. For an overview on business unit and budget version concepts please refer to our help note – Understanding Calxa Business Units and Budget Versions, and for details on editing Metrics please refer to our help note – Using Metrics. Editing budgets can be used to create a new budget or edit an existing budget. This document explains the detailed editing of budgets. If you are creating Account budgets from scratch you should first consider using the Calxa Budget Factory. 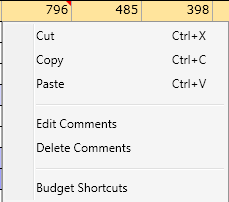 To open a budget for creating a new or updating an existing budget you must first click the Edit button on the main ribbon. 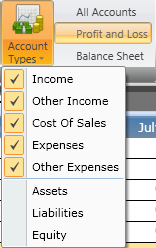 In the Budget Parameters screen, select the Account Budgets. For Metric Budgets or Metric Actuals, please refer to the help note Using Metrics. Note: For more details on these parameters, refer to the Budget Parameters Screen section below. Please be aware that each Budget Version holds multiple years of budget data and all the business unit budgets within each year. A new budget version is therefore not required for each year or each business unit. For an overview on business units and budget versions please refer to our Help Note Understanding Calxa Business Units and Budget Versions. 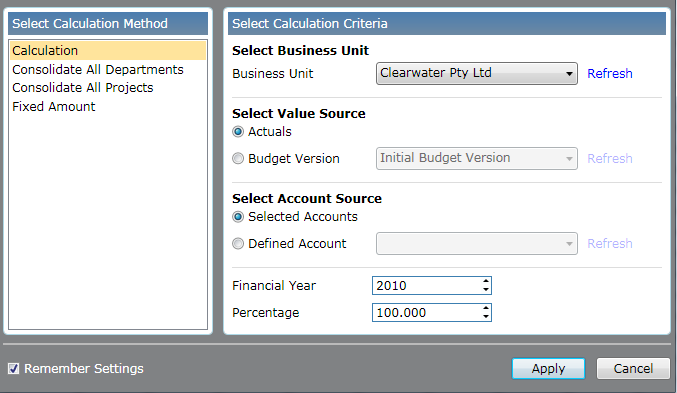 The Budget parameters screen has three sections to help you choose which budget to open: Business Unit, Financial Year and Budget Version. A common property in all three sections is the data column. A gold bar in this column indicates if there are any budgets stored for that selection. In the example below the business unit 120C Self-Defence Cwealth, Financial Year 2014-2015 and Budget Version Current Forecast are selected. You can see that there are gold bars on all of these selections. Therefore budgets have been recorded against the 120C Self-Defence Cwealth 2014-2015 Current Forecast. You can also see that there is no gold bar against the Not-For-Profit inc. Business Unit. This shows that Not-For-Profit Inc. Business Unit does not have any budgets for the 2014-2015 Current Forecast. If you make any selection change all other data columns will be refreshed accordingly. Calxa Express users will only see the organisation business unit in this screen. 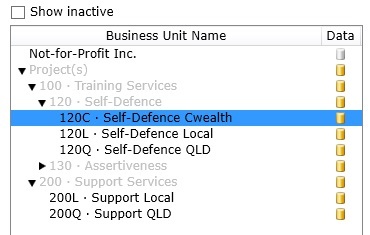 The business unit section, lists your business units as per your accounting file with your organisation first followed by any departments and then projects (You have the option of changing this terminology if you wish, refer to our help note Understanding Calxa Business Units and Budget Versions). Both the number and name are listed. To open a business unit budget you must first select the appropriate business unit from this list. You can collapse or expand sections of this list by clicking on the black arrow next to business unit headers as shown with the business unit 130-Assertiveness below . Note: checking the Show Inactive checkbox will show all business units including those that are marked as inactive in your accounting system. The financial year section lists the financial years. Calxa will set these periods from your accounting file. For example if you use a calendar year then calendar years will be displayed. Also in the financial year section is a Locked column. This column indicates whether the budget can be edited. Administrator users can lock and unlock budgets by clicking on the padlock symbol (To manage users refer to help note – Configure Calxa Users and Permissions). The example below shows that 2010 through 2014 ending financial years for the selected budget version are locked. Locking a budget for a financial year applies to all business units in that year. Locking only applies to the single budget version. The budget version section lists the current versions available. This is not only the section where you select the appropriate version for editing, but also where you can create new versions, copy, rename and add notes. This section may be handy for creating approved and forecast budgets or scenario budgets such as worst case. Utilising the locking feature from the financial year section you can lock an approved budget so it cannot be edited in particular years. Click the little black arrow to show or hide the budget version notes. Click New to create a new empty budget version. Click Copy to copy the selected budget version including all the business unit budgets across all financial years. 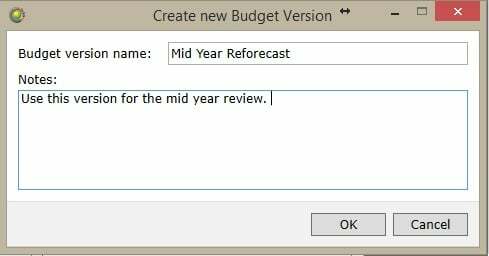 If you need to copy specific years between existing budget versions then the Budget Factory can be used for this task. Click Edit to edit the version name or update the notes. Click Delete to delete entire budget version. Warning: this option cannot be undone and it deletes multiple years and business units. This section assumes you have opened a budget for editing; if not please see the Open Budget section. Once you have a budget open for editing the top ribbon will now display the Account Budgets ribbon menu and the Budget Grid. 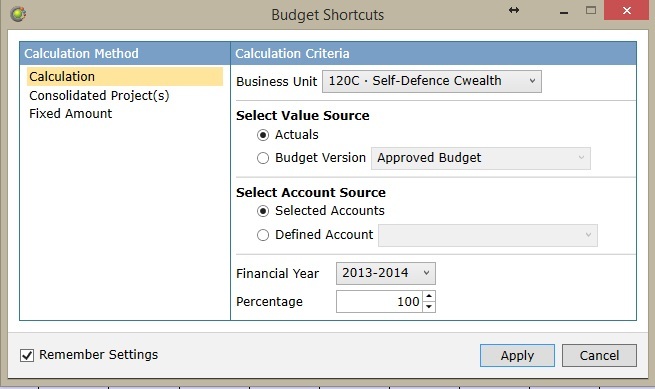 Takes you back to the Budget Parameters screen to create or open a different budget. Undo most recent operation followed with the next most recent with subsequent clicks. Redo most recent undone operation followed by the next most recent with subsequent clicks. Saves changes made to the budget. Must click this before closing the edit budget grid. Cut selected data for pasting to another account. Copy selected data for pasting to another account. Paste, cut or copied data to selected account or cell. Displays account numbers in the budget grid next to account names. Displays opening and closing balances in the budget grid for Balance Sheet budgets. Select to display all accounts, only profit and loss or only balance sheet accounts. 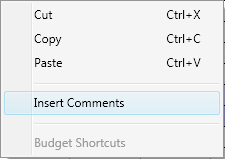 Apply budget shortcuts to specified accounts. Refer to Budget Shortcuts section. Depending on the view options set in the Main Tools tab, the budget grid will look similar to the example below. You can type numbers directly into cells in the budget grid, simply click on the relevant cell and type the number. You can type a number into the Total column and Calxa will distribute the total across all months proportionally according to the values that are already available. This rule maintains seasonal or scheduled fluctuations in monthly budgets. Entering 0 in the total column will clear all monthly amounts. or right click to Delete Comments or Edit Comments. 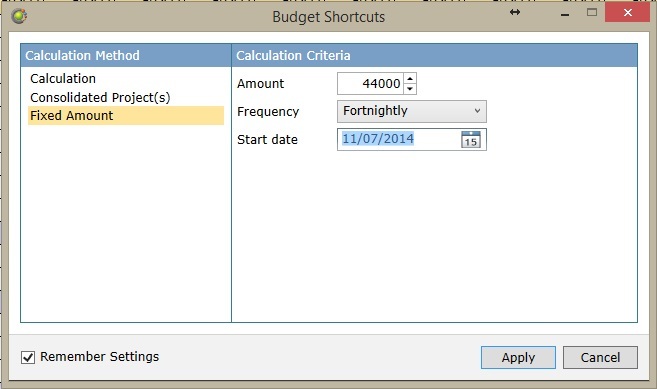 Budget shortcuts provide a number of calculation options to populate your budget data. 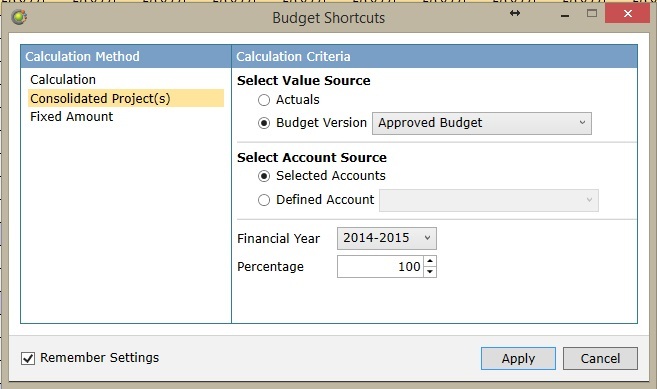 By selecting a single or multiple accounts you can also apply budget shortcuts to these accounts. (Note – If no accounts are selected, shortcuts will apply to all accounts in your current view.) Click on an account to select it. To select multiple accounts use the Shift or Ctrl keys on your keyboard as appropriate. The Shift key can be used to select a range of accounts, hold the Shift key and select two accounts to select all accounts in this range. The Ctrl key can be used to select multiple accounts, hold the Ctrl key and click on all accounts you wish to select. Set the appropriate settings and click Apply: Explanation of shortcuts types to follow. Note: By checking the Remember Settings check box, settings will be remembered next time you apply shortcuts to this row. Calculation allows you to populate budget data based on other account actuals or budgets. Select the Business Unit you wish to use as your source. Select the Value Source you wish to use for your calculations: Actuals or Budget Version. Selected Accounts should be used for creating budgets based on the same account. For example if calculating budgets based on a prior year actuals. Defined Account allows you to select any other account from the selected business unit. For example to calculate superannuation as a percentage of the wages budget or cost of sales as a percentage of an income budget. Select the Financial Year of the source account you wish to use for your calculations. Another example for this shortcut might be to calculate accumulated depreciation or accrued expenses on the balance sheet where you have budgeted on the P&L side across multiple Departments or Projects. Selected Accounts should be used for creating an organisation budget from department or project budgets. Defined Account allows you to select any other account from the selected business unit. This should be used for specific scenarios like accumulated depreciation or accrued expenses. Fixed amount can be used to apply budget data to an account where there are fixed regular values. For example wages may be a fixed fortnightly value paid on Tuesdays. Using this shortcut will calculate how many pay days will be in each month and apply the budget values.